The elephant is in the room. Now we can see it, we can’t ignore it. This is what happened when facilitating a recent team development workshop. Working with a leadership team to identify behaviours that support the achievement of their courageous goal, it became obvious that there was a big unresolved issue that, up to now, had not been talked about. The complex matrix structure was not working: goals were misaligned, divisions were competing rather than cooperating, and the feeling of ‘one team, one organisation’ had been lost. When sub-teams were discussing the behaviours to support success, one sub-team identified this structural problem. They questioned if they should mention this when feeding back to the main group as this had been an unspoken issue for a long time. After this round of sub-group feedback, the other two groups wholeheartedly agreed. This was a case of the emperor’s new clothes. Everyone knew, but nobody spoke. 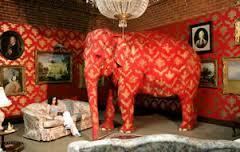 Nobody was willing to go into the zone of uncomfortable debate to address the elephant in the room. Now the elephant was obvious, we needed to talk about it. It was clear that there were very strong feelings around the matrix structure. Some people valued it, some resented it. If was as if points had been scored over the years, and the winners and losers in this corporate game had very strong memories. This influenced their views and positions were now being taken in this discussion. As the group discussion progressed, a feeling of tension steadily grew, but something was still not being said. It was as if people remained in the zone of comfortable debate, they did not want to risk an argument or damage relationships so were holding back. However, the tension continued to build, and there was clear frustration that progress was not being made, until one of the participants said “What is it that really pisses you off about this?” This question changed the tone of the discussion; there was a cathartic release of tension, and an audible exhalation from a number of people. This eased the atmosphere and the conversation flowed much more cooperatively. This breakthrough was only achieved by the participants being willing to speak their truth, using tension as a constructive energy, and a cathartic intervention. I’ve experienced this cathartic release several times, either with individuals or teams. An intervention creates a shift, and allows an openness never experienced before. It is as if the tension builds to a tipping point. Once tipped, the world permanently changes; reality is now different. What examples do you have of this cathartic release that creates a breakthrough? ‹ Coaching Feedback : When is it OK to give Negative Feedback?